Have you ever heard the phrase “imitation is the sincerest form of flattery”? I believe it means that if you really like something you will try to copy it. Right now, I am hoping that KIND bar (a sponsor of Snack Girl’s book campaign) doesn’t mind my imitation. KIND bar was gracious enough to give me KIND bars to send to people who buy Snack Girl To The Rescue! before it goes on sale on April 15th. I love KIND bars and KIND has rescued me in many airports, convenience stores, and gas stations. But, this didn’t stop me from trying to make my own fruit and nut bar. 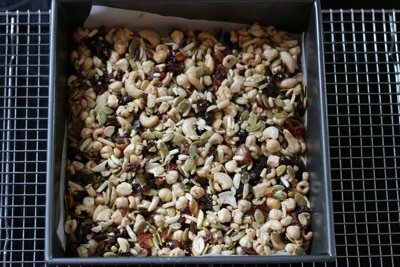 My kitchen cabinets are filled with little bags of nuts and dried fruit from all the recipes that I attempt. So, I grabbed some slivered almonds, hazelnuts, and pumpkin seeds and mixed them with raisins and dates. These are now missing. I should call around my neighborhood and see who stole them. What I like about these bars is that I can make them smaller than a KIND bar and put them in a little baggie to toss in my purse. I like my snack to be around 100 calories so this is a good fit. Preheat oven to 325 F. Line an 8-inch square baking pan with parchment paper AND spray it with non-stick spray for easy removal of the bars. Cereal: Rice Krispies, Puffed wheat, Cheerios (chopped), Brown Rice cereal, etc. !!! Thank you so much. I didn't realize that one could replace corn syrup with brown rice syrup. That is, in itself, a great revelation! Could you use honey in place of corn syrup? These look awesome. I love coconut so if I try it I may throw some dried flakes in the mix. honey or dates syrop (Silan) is a much better option, or even melted dark sugar will do the trick. i wonder if these tempting bars can be done without the cereal. or could oates finely chopped could be roasted a bit and then used instead of the cereal. i am going to try. I am for sure trying this, thank you. I like the Kind Bars as well. They are quick, easy, and filling when your on the go. wholeshome and fantastic. You're the Best, as I said many times before. This recipe was formulated for diabetics. It is a great one! Shelly, that recipe looks like it was made for an army! LOL! I also wonder if Honey can be used in place of Corn/Brown Rice Syrup? of butter, also maybe cut recipe in half. Honey may be too thick for this to work - and they would be too sticky. If you tried it the worst thing that would happen is that you might have crumbles instead of a bar. I say give it a go. You can use all nuts and no cereal if you want. The cereal lightens them a bit. This is a great way to make a healthy snack. If honey and maple syrup are not thick enough to suit, just boil the water out of them and add some coconut sugar (lower glycemic) until the desireable consistency is reached. BTW, why not use oats instead of boxed cereals, although the choices mentioned are almost as good as it gets in the cereal aisle except maybe Kashi or Muelsi? Oats are a whole grain and packed with vitamins. I looked up the nutrition value in Kind bars and yours look a lot better Snack Girl. This company still appeals to the sugar, fat, salt addictions we all have. Seriously, if all these are not in our foods we probably would not eat at all. The sugar, unless it is coconut or palm sugar, would keep me from eating these. Have you tried these sugars? They are natural, delicious and properly used won't elevate your blood sugar. What kind of cereal did you use Snack Girl? Also could you use Rice Krispies? Ok, I reread the recipe! The cereal is listed there...sorry! 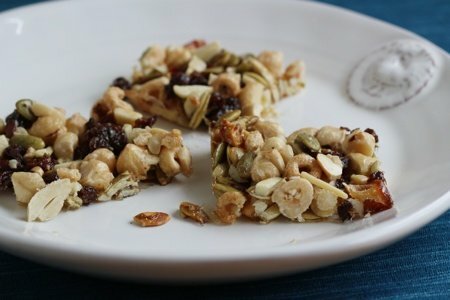 I make my own power bars for my daughter who has a tree nut allergy. I add flaxseed, sunflower seeds, protein powder, egg whites, agava, coconut flower, dates or raisons...whatever I have!!! shelly what is your recipe for??? honey is used for generations in the middle east for sesame bars and nuts bars. but it has to be cooked and boiled, then the nuts or sesame are put in and then put on a shallow dish to cool. it hardens very quickly so it has to be cut into bars as soon as the mixture is stabilized. it requires no baking.